The fight is never over. Life in Arafel is no longer safe. Not since August’s disappearance, and whispers of a ghost controlling Pantheon. Meanwhile, Talia stands torn between secretive twin, Eli, and best friend, Max. Betrayal forces Talia to leave the sanctuary of her forest home as she pursues the stolen Book of Arafel. A book which could destroy the freedom of all those she loves if it falls into the wrong hands. And when she enters the ancient ruined city of Isca, she fights to protect the vulnerable from the iron grip of the Pantheon, while learning to fight for the man she loves. But with the shadow of the Black Aquila looming ever closer, will she put the freedom of others above her own, or will she follow her heart? This is Michelle Kenney’s thrilling second instalment in the Book of Fire Trilogy. City of Dust is the follow up to Book of Fire which for me was the perfect blend of history, mythology and science all set in a vividly imaginative dystopian setting. I originally thought that City of Dust would take place immediately after the catastrophic and emotionally crippling ending of Book of Fire…. oh no, Kenney has quite rightly mixed up the timeline so months and months have passed since the ending. However that meant I was missing one of my favourite characters for a little while, woe is me! This added just another layer of love and anticipation to the story, you get to catch up with characters to see how they're faring and all the while yearning for the later chapters. Talia was such an incredible character, I already liked her in Book of Fire but her character arc was brilliant and her personal growth was astounding. I loved how she battled with her trauma of being Under the Dome and that even though she was now free her capture continued to affect her every day life. Talia was the real driving point of the entire book, she was able to face her demons but what I loved is that she’s still flawed and will still continue to grow in order to help herself and her people. Friendship and it’s many forms played a big role in this book which I absolutely adored. I was thrilled that Talia’s twin, Eli has lots more page time and we got to see a lot more of Talia and Eli interact as siblings. Eli for me is such an important part of the book, I love his relationship with animals and I also love how Kenney portray’s him as a deaf main character. And yes his he a main character, while I sincerely feel that this is a much needed representation what I applaud Kenney on is not only her inclusion of a deaf character but having a deaf character in the thick of the plot, in with the action, near death experiences the lot and not some left behind character that is only included for diversity’s sake. Also Eli is just an all around sweetheart, seriously what’s not to love? It’s quite clear that I literally cannot wait to get my hands on book three. I simply need to know what happens next, I refuse to think of the wait. 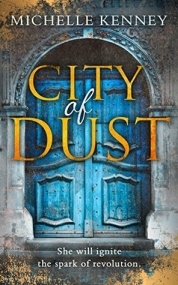 City of Dust clearly surpasses it’s predecessor. Kenney has upped the anti and raised the stakes, the action never stopped and the adventure was thrilling.. although I gotta love the angst and tension of a ship I am adamant will sail! Again, Kenney wonderfully weaves mythology, history and science together creating a thrilling and gripping read filled with myths and monsters.